Ramform Sovereign is perhaps one of the most unique models made by Nigel so far. The real vessel is used for seismic survey work using a towed array and acoustic sounders. The model is under construction and is entirely scratch built. Most of the model build is hidden at the stern with a multitude of winches, cables and sounding equipment- all has to made and positioned before the deck is completely attached. On deck there is a mass of moving walkways still needed to be made which will test Nigel's sanity. If you've seen the towed array this will amaze you! The model is built to 1/75 scale from the Billings kit range, Richard has a particular interest in this type of vessel from his time working on the oil rigs in the North Sea. Richard has added his own personal touch to the kit by adding a working light system in the hull and superstructure. HMS Bulldog was one of four Bulldog class hydrographic survey ships of the Royal Navy. She was built by the yacht builder Brooke Marine and launched in 1968.Displacing just 1088 tons and managing a top speed of just 15knots, the ship was known for both her attractive lines and excellent sea keeping. Her pennant number was originally A317 but this was changed in 1998 along with that of other survey ships to an H-prefix (for Hydrographic - S for survey already being in use for submarines) to emphasise that they were survey ships rather than naval auxiliaries. She was finally decommissioned on 26 July 2001. She was sold in August 2001 for conversion into a luxury yacht. She was damaged in a fire in May 2004 whilst in New Zealand and the conversion was not completed. Built in 1990 by Campbeltown Shipbuilders Ltd, MAGGIE M operates out of Scarborough harbour in Yorkshire, United Kingdom. The vessel is designed for twin-rig trawling and the aluminium shelter-deck is a cover over the fish processing room. MAGGIE M. is designed to operate in the most arduous sea conditions and the model performs brilliantly on rough waters. ​The model is built to 1/32 scale from the Model Slipway kit by Mick Shamrock and weathered by Sheila Kingdon. Drumbeat of Devon is a Fishery Protection Vessel which patrols the British coastline. The model is built to 1/24 scale from the Model Slipway kit and is un-fortunately now unavailable in their range. Typical of many of the period 'Imara' was a twin screw harbour tug, built to a Crown Colonies contract for delivery to Dares-Salaam. Thereafter she had a colourful history, ultimately entering Royal Naval service where she was renamed 'Perseverance'. Built to 1:32 scale, length is 44" and beam 12", the model is a Caldercraft kit, I purchased this tug several years ago, and refurbished it. Powered by a bosch fan motor, it has sound generator of a steam engine. Installed is a water pump which shoots out water from a hose held by a deckhand, which can swivel, by means of a servo. 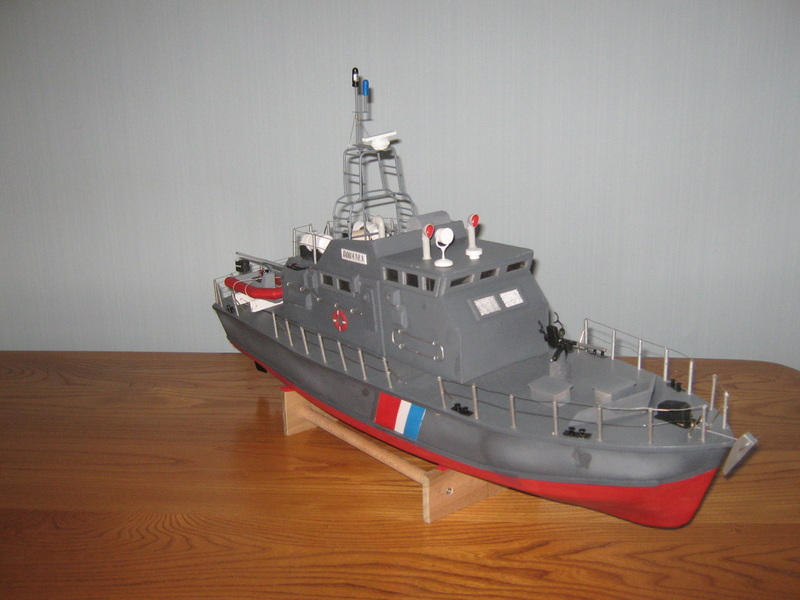 Mistral - A French customs boat, scratch built from a free marine modelling plan available from Traplet. The model is a semi-scale model built approximately to 1/32 scale.